I put this video together because I don’t think enough people truly understand who and what David Avocado Wolfe is. He has somehow amassed over 7,000,000 Facebook followers, and I’m sure many of those followers aren’t aware that they’re essentially supporting dangerous ideas that border lunacy. Some may argue that he’s just a guy who has strange beliefs and we should leave him alone, but the ideas he pushes become hazardous and have real-world consequences when he starts giving ‘medical advice’ to people who are suffering from diseases that require real medical treatment. Daniel Bennett of AAPN has also written a great article that completely dismantles David’s claims on salt. Here is a great explanation on the David Avocado Wolfe phenomenon. Here is another great article on David Wolfe. Debunking Summary of Scientific Evidence for Creation (Part I & II) Duane Gish, Ph.D. I guess firstly I should introduce you to Duane Tolbert Gish, Ph.D.
For a person with a Ph.D, I would expect better, but when a person will turn his back on the scientific method and make claims he cannot support while putting forward arguments in debate and citing it as scientific then we have a problem. He has a worldview which he promotes and will stoop to new levels to try to this worldview in with science. We have all heard of the Gish Gallop technique of bombarding your debating opponent with far too much information to debunk thereby swamping them with too many rebuttals to present, often the information are half truths, if they even make it to being a truth at all. The term was coined by Eugenie Scott of the National Center for Science Education, named after our friend Prof Gish. It seems Duane knew his comments would not stand up to scrutiny so he would make a comment and not dwell on it. Claiming there are no fossil precursors to the dinosaur Triceratops (despite obvious precursors such as Protoceratops being well-known since the 1920s). Gish made other similarly incorrect statements about the fossil record, including claims about transitional forms, the fossil record for birds and the status of Archaeopteryx. Claiming that Solly Zuckerman had access to modernknowledge of Australopithecus yet still stated they were not ancestors of Homo sapiens — Zuckerman’s original conclusions were based on evidence available before the Lucy fossil was discovered, revolutionising the field of physical anthropology. Claiming that evolution by natural selection is rendered impossible by the second law of thermodynamics. Claiming that the dinosaur Parasaurolophus used its distinctive crest as a mixing chamber for breathing fire. Another one worth mentioning is his “Bullfrog Affair”. The Bullfrog Affair itself starts with the KPBS production, “Creation vs Evolution: Battle in the Classroom”, which aired 7 July 1982. After Dr. Doolittle related his story of the chimpanzee blood proteins, Dr.Duane Gish responded: “If we look at certain proteins, yes man then, it can be assumed that man is more closely related to a chimpanzee than other things. But, on the other hand, if you look at certain proteins, you will find that man is more closely related to a bullfrog than he is to a chimpanzee. If you focus your attention on other proteins, you’ll find that man is more closely related to a chicken than he is to a chimpanzee.” This was immediately followed by Dr. Doolittle’s response, “Oh bullfrog!I’ve heard that gibberish before, I have to tell you.” This was the first recorded use of “Bullfrog” that I am aware of. Then Doolittle indicated abook full of amino acid sequences from thousands of proteins taken from many hundreds of species and offered Gish all his worldly belongings, a ’63VW and half a house, if Gish could find just one protein in chickens or bullfrogs that is more closely related to human proteins than chimpanzee proteins. Robert Schadewald, then Minnesota Committee of Correspondence liaison andpresently editor of _NCSE Reports_ (formerly _Creation/Evolution Newsletter_)watched that show. Since Gish’s claim sounded like nonsense, he checked it outwith a few biochemists, who had never heard of such proteins. So Schadewald started a three-year-long quest for Gish’s source. Doolittle responded to Schadewald’s letter with extensive documentation for his statements about human and chimpanzee proteins. Requests for Gish to dolikewise were met with evasion, obfuscation, and silence. As far as I know Gish did not respond to requests before his death other than saying he will present relevant documentation to support his claim, but such documentation has never actually surfaced. Poisoning the well, ad hominem I hear you cry but in all honesty merely alerting the good readers as to the lengths this guy will go to in order further the creationist cause. Let us now dive in to Gish’s Summary of Scientific Evidence for Creation(SOSEFC). The problem with this is they start with a premise that there is a creator deity. They then take known scientific facts such as the sudden expansion of our universe and try to work backwards using retrodictive techniques to align this with scripture. This is not science. 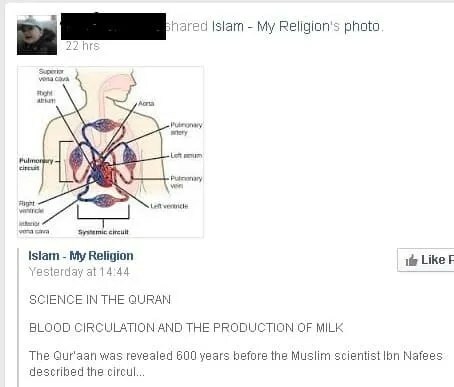 This is the opposite of science and a technique I have seen employed by Islamic charlatans like Zakir Naik. A vile practice. To compare that with an actual scientific theory, which has been worked on for 150 years and which has been added to and finally supported by the quite recent science of gene mapping. That is DNA evidence, the same type of evidence used to show familial ties in court rooms globally now shows familial ties between us and our fellow primates. The fossil record ties in nicely and supports predictions made by the modern model of evolution. Kinds? I fail to find anywhere in my biology textbooks the mentions of kinds. Phylogeny and taxonomy may still be debated topics in the real science world but to mention the biblical kinds makes a mockery of biology. We can also explain vertical evolution and the adding of information in DNA, gene duplication explains this perfectly. The Universe and the Solar System Were Suddenly Created. The First Law of Thermodynamics states that the total quantity of matter and energy in the universe is constant. The Second Law of Thermodynamics states that matter and energy always tend to change from complex and ordered states to disordered states. Therefore the universe could not have created itself, but could not have existed forever, or it would have run down long ago. Thus the universe, including matter and energy, apparently must have been created. The “big-bang” theory of the origin of the universe contradicts much physical evidence and seemingly can only be accepted by faith.1 This was also the case with the past cosmogonies theories of evolutionists that have been discarded, such as Hoyle’s steady-state theory. The universe has “obvious manifestations of an ordered, structured plan or design.” Similarly, the electron is materially inconceivable and yet it is so perfectly known through its effects,” yet a “strange rationale makes some physicists accept the inconceivable electrons as real while refusing to accept the reality of a Designer.” “The inconceivability of some ultimate issue (which will always lie outside scientific resolution) should not be allowed to rule out any theory that explains the interrelationship of observed data and is useful for prediction,” in the words of Dr. Wernher von Braun, the renowned late physicist in the NASA space program. Ahhhh, the beautiful Physics, much more my preferred flavour of science. I am not sure when this was first presented by Gish but recently Prof. Mir Faisal of the University of Toronto showed using Inflation Theory and Double Special Relativity how the universe could have come from the spontaneous appearance of a single virtual particle. Mir Faisal is a creationist but an honest one. Also the laws of physics only come in to play a Planck unit of time after the sudden expansion. The laws of thermodynamics cannot be quoted and meaningfully to pre-big bang to say it could not have happened. No rules means anything goes. We observe the spontaneous appearance of virtual particles in a vacuum with no apparent creator involved so Gish is very much falling foul of presupposition of a deity without reason to assume one. As far as we can tell one is simply not needed. At the time of writing this was also most likely an argument from personal ignorance. As for the big bang being faith based, if it were not for the cosmic background radiation, our universe expanding from a single point in all directions and red shift then this may be true, however we do have those facts so it is silly to claim no physical evidence. I can only call it a lie, relying on the gullible to just accept his claim. And again Gish relies on presupposition of a creator without actually showing one to exist. Simply fallacious. Now you can quote fallacy fallacy however we can show no deity needed so in this instance pointing out the fallacious nature of his argument which he needs to do to support his worldview is perfectly justified. He is correct however that the universe is at a pretty perfect level in every way for it to exist as it is…. Think about it for a second, if it was not at the balanced state it is what would there be, either no universe because it could not sustain itself or the universe would simply be different. But it is not different and it does exist, that just shows it is how it is and doesn’t collapse on itself. It does not mean it MUST have a designer. Life appears abruptly and in complex forms in the fossil record,2 and gaps appear systematically in the fossil record between various living kinds.3 These facts indicate that basic kinds of plants and animals were created. The Second Law of Thermodynamics states that things tend to go from order to disorder (entropy tends to increase) unless added energy is directed by a conversion mechanism (such as photosynthesis), whether a system is open or closed. Thus simple molecules and complex protein, DNA, and RNA molecules seemingly could not have evolved spontaneously and naturalistically into a living cell;4 such cells apparently were created. The laboratory experiments related to theories on the origin of life have not even remotely approached the synthesis of life from nonlife, and the extremely limited results have depended on laboratory conditions that are artificially imposed and extremely improbable.5 The extreme improbability of these conditions and the relatively insignificant results apparently show that life did not emerge by the process that evolutionists postulate. When animals, plants and other organisms die, they typically decay completely. But sometimes, when the conditions are just right, they’re preserved as fossils. Several different physical and chemical processes create fossils, according to the New York State Geological Survey. Freezing, drying and encasement, such as in tar or resin, can create whole-body fossils that preserve bodily tissues. These fossils represent the organisms as they were when living, but these types of fossils are very rare. Most organisms become fossils when they’re changed through various other means. The heat and pressure from being buried in sediment can sometimes cause the tissues of organisms — including plant leaves and the soft body parts of fish, reptiles and marine invertebrates — to release hydrogen and oxygen, leaving behind a residue of carbon. This process — which is called carbonization, or distillation — yields a detailed carbon impression of the dead organism in sedimentary rock. The most common method of fossilization is called permineralization, or petrification. After an organism’s soft tissues decay in sediment, the hard parts — particularly the bones — are left behind. Considering this we are lucky to have the thousands of fossils which we have now. It is not a simple process. What we do have are transitional fossils. Now I would argue that each new generation born is a transitional form from the last but it is very difficult to see the tiny changes. In fig 1 below you can however see transitional skull fossils showing the transition of a forward breathing nostril to a mid skull breather to finally the recognisable nostril of the modern dolphin and whale. I see another argument from ignorance with regards to RNA and DNA and complex proteins not being able to evolve, He is not wrong because that is not the claim of science. Prof Jack Szostak winner of the 2009 Nobel Prize in Physiology and Medicine and Professor of Genetics at Harvard Med, Prof of Chemistry and Chemical Biology at same, Investigator, Howard Hughes Medical Institute, Alex. A. Rich Distinguished Investigator, and member of Department of Molecular Biology, Massachusetts General Hospital would show how life could begin. Oh an appeal to authority booms from the voice boxes of the theist throng – Well yes it is and for good reason. He is just that. And my appealing to his authority does not refute nor debunk his work on abiogenesis. I would love for you to give over 9 minutes of your time to watch this simple video from the Origins collection, The Origin of Life. And probably the biggest breakthrough to date, self replicating RNA forms in lab which is recreating old earth environment . I can only guess these experiments were not carried out by the time of Gish’s publishing this pamphlet. Also he calls molecular biologists “Evolutionists”. How uncouth, pandering to an audience and trying to cast dispersions through a fabricated title. All Present Living Kinds of Animals and Plants Have Remained Fixed Since Creation, Other than Extinctions, and Genetic Variation in Originally Created Kinds Has Only Occurred within Narrow Limits. Systematic gaps occur between kinds in the fossil record. None of the intermediate fossils that would be expected on the basis of the evolution model have been found between single celled organisms and invertebrates, between invertebrates and vertebrates, between fish and amphibians, between amphibians and reptiles, between reptiles and birds or mammals, or between “lower” mammals and primates. While evolutionists might assume that these intermediate forms existed at one time, none of the hundreds of millions of fossils found so far provide the missing links. The few suggested links such as Archoeopteryx and the horse series have been rendered questionable by more detailed data. Fossils and living organisms are readily subjected to the same criteria of classification. Thus present kinds of animals and plants apparently were created, as shown by the systematic fossil gaps and by the similarity of fossil forms to living forms. A kind may be defined as a generally interfertile group of organisms that possesses variant genes for a common set of traits but that does not interbreed with other groups of organisms under normal circumstances. Any evolutionary change between kinds (necessary for the emergence of complex from simple organisms) would require addition of entirely new traits to the common set and enormous expansion of the gene pool over time, and could not occur from mere ecologically adaptive variations of a given trait set (which the creation model recognizes). Speciation experiments have shown this is just not true in real time experiments. Gaps in the fossil record are to be expected but to say there are no transitional fossils between the types mentioned is the biggest lie so far. Here is a list to peruse. // The few suggested links such as Archoeopteryx and the horse series have been rendered questionable by more detailed data.// Citation needed please good professor!! Stating gaps means a sudden creation is weak to say the least, there are gaps yes but this was explained earlier in this article. Because of the process involved we are lucky to have the evidence in the fossil record which we have. Mutation and Natural Selection Are Insufficient To Have Brought About Any Emergence of Present Living Kinds from a Simple Primordial Organism. The mathematical probability that random mutation and natural selection ultimately produced complex living kinds from a simpler kind is infinitesimally small even after many billions of years. Thus mutation and natural selection apparently could not have brought about evolution of present living kinds from a simple first organism. Mutations are always harmful or at least nearly always harmful in an organism’s natural environment.9 Thus the mutation process apparently could not have provided the postulated millions of beneficial mutations required for progressive evolution in the supposed five billion years from the origin of the earth until now, and in fact would have produced an overwhelming genetic load over hundreds of millions of years that would have caused degeneration and extinction. Natural selection is a tautologous concept (circular reasoning), because it simply requires the fittest organisms to leave the most offspring and at the same time it identifies the fittest organisms as those that leave the most offspring. Thus natural selection seemingly does not provide a testable explanation of how mutations would produce more fit organisms. Here we have a misrepresentation of probabilities. It may have been unlikely but not impossible. As for survival of the fittest, another strawman. It need not be the fittest but the best adapted. Man and Apes Have a Separate Ancestry. Although highly imaginative “transitional forms” between man and ape-like creatures have been constructed by evolutionists based on very fragmentary evidence, the fossil record actually documents the separate origin of primates in general, monkeys, apes, and men. In fact, Lord Zuckerman (not a creationist) states that there are no “fossil traces” of a transformation from an ape-like creature to man. The fossils of Neanderthal Man were once considered to represent a primitive sub-human (Homo neanderthalensis), but these “primitive” features are now known to have resulted from nutritional deficiencies and pathological conditions; he is now classified as fully human.15 Ramapithecus was once considered to be partially man-like, but is now known to be fully ape-like.16 Australopithecus, in the view of some leading evolutionists, was not intermediate between ape and man and did not walk upright. The strong bias of many evolutionists in seeking a link between apes and man is shown by the near-universal acceptance of two “missing links” that were later proved to be a fraud in the case of Piltdown Man (Eoanthropus) and a pig’s tooth in the case of Nebraska Man (Hesperopithecus). The Earth’s Geologic Features Were Fashioned Largely by Rapid, Catastrophic Processes that Affected the Earth on a Global and Regional Scale (Catastrophism). Again a misrepresentation. The palates of the earth shift which causes changes on the surface, hance why mountains grow a matter of inches in 1 year. For sure catastrophic events have an impact on physical features of the planet but Gish makes out that these are the only events which shape our planet. For sure in some areas such as Joggins, Nova Scotia there were floods but that does not prove a global flood. It just show that yes there were floods in Joggins. The Inception of the Earth and of Living Kinds May Have Been Relatively Recent. Radiometric dating methods (such as the uranium-lead and potassium-argon methods) depend on three assumptions: (a) that no decay product (lead or argon) was present initially or that the initial quantities can be accurately estimated, (b) that the decay system was closed through the years (so that radioactive material or product did not move in or out of the rock), and (c) that the decay rate was constant over time.20Each of these assumptions may be questionable: (a) some nonradiogenic lead or argon was perhaps present initially;21 (b) the radioactive isotope (uranium or potassium isotopes) can perhaps migrate out of, and the decay product (lead or argon) can migrate into, many rocks over the years;22 and (c) the decay rate can perhaps change by neutrino bombardment and other causes.23 Numerous radiometric estimates have been hundreds of millions of years in excess of the true age. Thus ages estimated by the radiometric dating methods may very well be grossly in error. Alternate dating methods suggest much younger ages for the earth and life. Estimating by the rate of addition of helium to the atmosphere from radioactive decay, the age of the earth appears to be about 10,000 years, even allowing for moderate helium escape. Based on the present rate of the earth’s cooling, the time required for the earth to have reached its present thermal structure seems to be only several tens of millions of years, even assuming that the earth was initially molten.24 Extrapolating the observed rate of apparently exponential decay of the earth’s magnetic field, the age of the earth or life seemingly could not exceed 20,000 years.25 Thus the inception of the earth and the inception of life may have been relatively recent when all the evidence is considered. There are so many dating techniques available to science now. Many work independently of the other and when they all come to the same conclusion it is fair to say we can supply accurate dates. None of which point to a young earth theory being even close to being correct. The evidence from cosmology and various other branches of the sciences do not prove a deity. In fact science removes the hand of a god with every new breakthrough. No longer do we assign demonic possession to a person that fits and suffers seizures. No longer do we sacrifice virgins to the angry volcano god. We understand the tides and need no longer hope Neptune will not send a wave to take a ship and we know that doing a rain dance will serve no purpose.